In recent years, Republicans have dramatically intensified their war on organized labor. The battle plan was simple: Pass laws that limit union political spending and make it more difficult to collect dues. Since 2010, six states have passed “right-to-work” laws, meaning that workers can benefit from union representation without paying to keep the union funded. In other states, Republican legislatures have hamstrung public-sector unions by denying them collective-bargaining power. Everyone remembers the high-profile barottle in Wisconsin that Governor Scott Walker launched in 2011, but the union-busting efforts have not slowed down. In 2017, Missouri and then Kentucky’s right-to-work laws were rammed through within weeks of Republicans’ gaining power, and Iowa successfully limited the collective-bargaining power of public-sector unions. There was a push to do the same in New Hampshire, though it failed. Few of these battles drew the same attention as what happened in Wisconsin, particularly after Donald Trump’s carnival began dominating news coverage. But there is good reason to believe that all these efforts will profoundly change the future of American politics. In 2018, five Democratic senators are up for reelection in states that have become right-to-work since 2012: Joe Donnelly in Indiana, Claire McCaskill in Missouri, Tammy Baldwin in Wisconsin, Debbie Stabenow in Michigan, and Joe Manchin in West Virginia, which went right-to-work in 2016. It’s unlikely all of these candidates will lose, but this new research suggests their path to victory is much narrower due to conservative right-to-work laws. In this new NBER paper, the researchers compared counties in states that became right-to-work with counties in neighboring states that did not become right-to-work, or that were previously right-to-work, and how they voted from 1980 to 2016. (This method that has also been used to study the minimum wage on employment and Medicaid expansion on political participation.) A simple state-by-state comparison might not be as useful here: Obviously, Republican-controlled states likely to pass right-to-work laws tend to have different voting patterns and outcomes than blue states. But by looking at bordering counties that are very similar politically, demographically, and economically, the effect of right-to-work laws can be more easily measured. The chart below shows the dramatic effect—for 12 years before right-to-work the counties are quite similar, while in the 12 years after there are deep gaps in Democratic vote share. The authors found similar declines in Democratic-candidate performance in Senate, House, and gubernatorial elections. The effects of right-to-work laws also hold at the state legislative level. Since the 2016 election, much ink has spilled over the massive state-level losses Democrats have faced since Obama’s election. This research suggests that right-to-work may be at least partially responsible: The authors estimate that Democrats control 5 to 10 percent fewer seats in state legislatures (in both chambers) after a right-to-work law is enacted. In line with previous research by Roland Zullo, who found that right-to-work and limitations on collective bargaining make it more difficult for unions to bolster turnout, this research found that right-to-work laws reduce turnout in presidential elections by 2 to 3 percent. Indeed, studying individual-level survey data, the authors found that the share of blue-collar workers reporting a get-out-the-vote contact declined by 11 percent following the passage of right-to-work laws, with no concomitant effect on white-collar workers. The share of campaign contributions from private-sector unions also drops by 1 to 2 percent, as does fundraising by Democratic candidates in state and local races. The effects aren’t impactful just for unions and the Democratic Party but also for the progressive movement more broadly. Working-class candidates—who past research finds are more likely to be progressive on economic issues—are less likely to win elected office after the passage of a right-to-work law. Right-to-work states have between 1 and 3 percent fewer working-class elected officials (defined as working in a non-professional, blue-collar job before running for office) in the legislature, and send fewer working-class candidates to the US House of Representatives. These political imbalances naturally appear to then shift state-level public policy to the right. Using standard measures of the liberalism of state policies, the authors found a decline in these policies following the passage of right-to-work laws. Over time, this shift would be roughly equivalent to the difference in policy liberalism between Illinois and West Virginia. Just consider policy in Wisconsin before and after the implementation of right-to-work. Few findings in social science have been as definitively established as the redistributive impacts of unions, and this NBER paper bolsters that body of work even further. International studies have clearly shown that in strongly union countries, the working class takes home more income. Nationally, the decline of unions in the United States correlates with a dramatic rise of wealth captured by the top 1 percent of earners. In another new study, political scientist Laura Bucci studied 39 years of state-level data and found that union strength leads to more equality, both in labor-market income and via more aggressive redistribution through government transfers. Unions reduce racial wage and wealth gaps, and many union contracts include rules mandating fair hiring and promotion standards, leading to less discrimination in the workplace. Recent research shows that de-unionization since the 1970s reduced weekly black wages by $49 per week. Research from the Center for Economic and Policy Research found that black union workers are far more likely than non-unionized black workers to have access to employer-sponsored retirement plans. These right-to-work laws threaten to exacerbate the already disturbingly large racial wealth gap. This new NBER paper supplements other research that has explored the political and economic impacts of weaker labor unions. Political scientists Benjamin Radcliff and Martin Saiz found that the strength of unions in a state is a more powerful determinant of liberal policy in the states than the power of the Democratic Party. Political scientists Thomas Volscho and Nathan Kelly found that unions exert a more powerful influence on the share of income going to the 1 percent than does the share of Congress that is controlled by Democrats. Other research also suggests that unions increase voter turnout, and that this effect is strongest for workers of color. More recent work on the impact of Citizens United finds that its effect on policy liberalism was muted in states with more powerful unions. This all has tremendous importance for the future of the Democratic Party, which mainly has taken unions for granted for years. The legislative priorities of unions have taken a back seat when Democrats are in power, despite the fact that unions are a central organizing institution for the Democratic Party. Pressured by centrist operatives in the mode of the now-defunct Democratic Leadership Council, who were looking to win over suburban professionals, Democrats sat on the sidelines as Republicans waged an assault on the ability of unions to act on behalf of working-class people. But while Democrats looked away, the corporate assault on unions increased dramatically in intensity. On the right, the origins of right-to-work laws are deeply racist: Early laws were aggressively pushed by white supremacists with KKK ties aiming to break up cross-racial working-class solidarity. At the same time, right-to-work advocates tried to use union discrimination to bolster black support for right-to-work. Working with sociologist Theda Skocpol, Hertel-Fernandez also found that the presence of a paid Americans for Prosperity director in a state increases the likelihood of a state’s passing laws that reduce public-sector bargaining rights by close to 30 percent. The two-pronged war on unions—both private sector and public sector—has already weakened the Democratic Party. While Democrats view politics primarily through the lens of technocratic policy fixes, Republicans think of politics as war, and their goal is to demobilize, humiliate, immiserate, and ultimately destroy their opponents. Democrats may struggle to understand why the GOP would do something like reject a Medicaid expansion, impoverishing their state and literally killing their own constituents. The brutal logic is quite simple: Dead poor people can’t vote, and poor people without health care have no reason to vote for Democrats. As it turned out, study after study has confirmed this electoral logic: Rejecting the Medicaid expansion led to thousands of deaths, but it benefitedRepublicans electorally. The Koch network has focused on changing the political playing field, and this new research strongly suggests this approach is reaping massive rewards. The GOP has strategically used its unprecedented state-level control to massively increase its chances of maintaining power. In materials to donors, the right has make its goal explicit: Crush democracy, unions, and universities—anything that could serve as a check on corporate power. 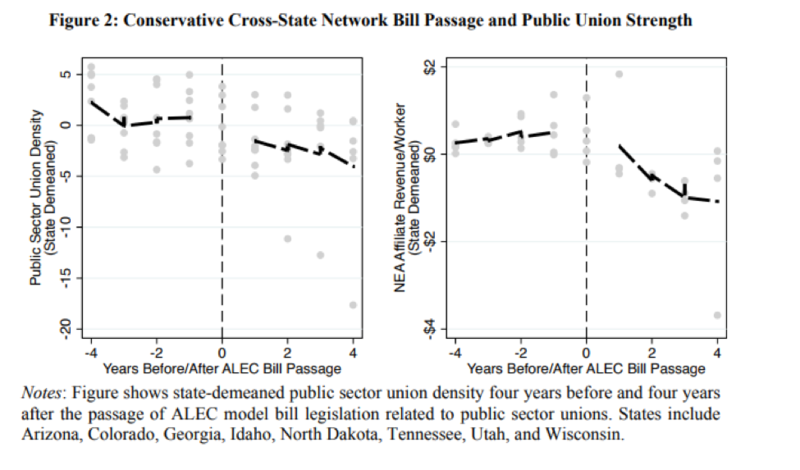 Hertel-Fernandez has done research showing that attacks on public-sector unions have similar political effects, with the passage of ALEC-model bills weakening public-sector union density and funding (see chart). Unfortunately, Democrats have historically done little to push back on the tide of right-to-work, and have made little note of whether they intend to repeal these laws if they gain state-level power. But more recently the party has woken up to the threat of the decline of unions. Center-left economists like Larry Summers have begun to warn about the dramatic decline of unions. Recently, Kirsten Gillibrand, Sherrod Brown, and Elizabeth Warren co-sponsored legislation in the Senate to ban right-to-work. Yet, for all of these heartening efforts, it’s possible that Democrats may ultimately head in the opposite direction. The decline of unions could further increase economic inequality and pull the Democratic Party away from its roots as a working-class party. Democrats increasingly raise money in Silicon Valley, not union halls—and recent surveys have shown that Silicon Valley donors are no friend of the union movement. As unions provide a smaller share of Democratic dollars, Democratic politicians will feel more pressure to emphasize the concerns of other donors. A recent study by political scientists Peter Enns, Nathan Kelly, Jana Morgan, and Christopher Witko found that as representatives take in a smaller share of contributions from unions, they become less likely to speak about issues related to jobs. As a result, unions have become weaker, reducing the influence of class over American politics. To abandon not just institutions of the working class but also class-centered rhetoric would weaken the Democratic Party. Progressives need to mobilize in opposition at the grassroots level—there is evidence this can work. 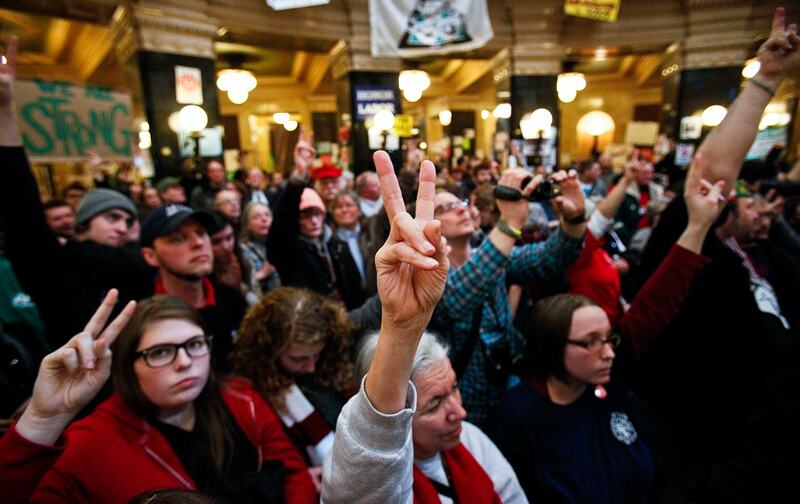 In 2011, Ohio voters overwhelmingly voted to repeal a law to limit collective bargaining among public-sector workers. In Missouri,advocates were able to get an initiative to overturn right-to-work on the ballot in 2018. As Democrats take back power in 2018 and 2020, they should use the legislative and executive branches along with the ballot-initiative process to repeal right-to-work laws. If Democrats take the Senate, they must push for card-check legislation that would make it far easier to form unions. If not, Democrats may find it difficult to ever compete again in states without a union to build class consciousness and win over working-class votes. Without unions, there will be no institution in American politics advocating for policies that benefit the vast majority of Americans who do not own capital. The worst-case scenario for America is that the vast swaths of the working class will move away from social democracy and toward xenophobia, populism, and authoritarianism. Democrats need to wake up. The death of unions imperils their party. They haven’t been acting like it.